Turn your cardboard to soil! I’m posting from an iPhone! 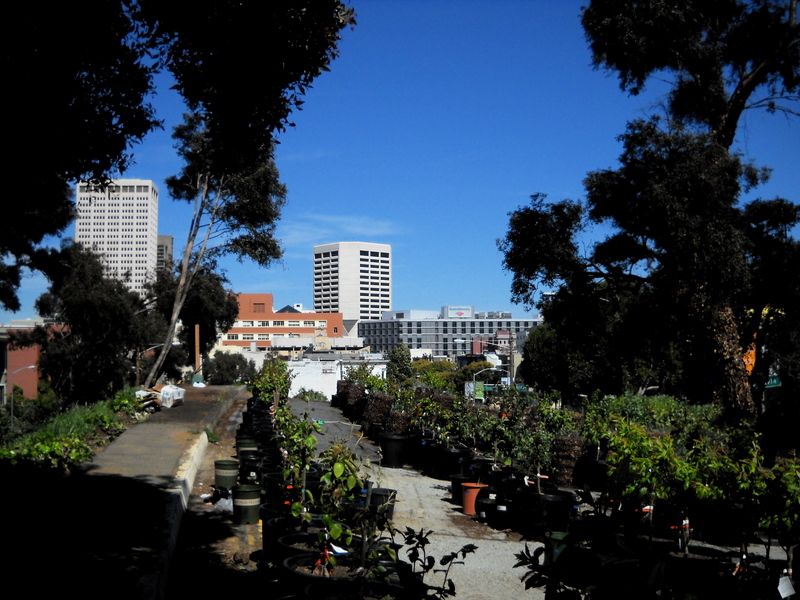 As you may know, Hayes Valley Farm is an interim-use urban farm project. 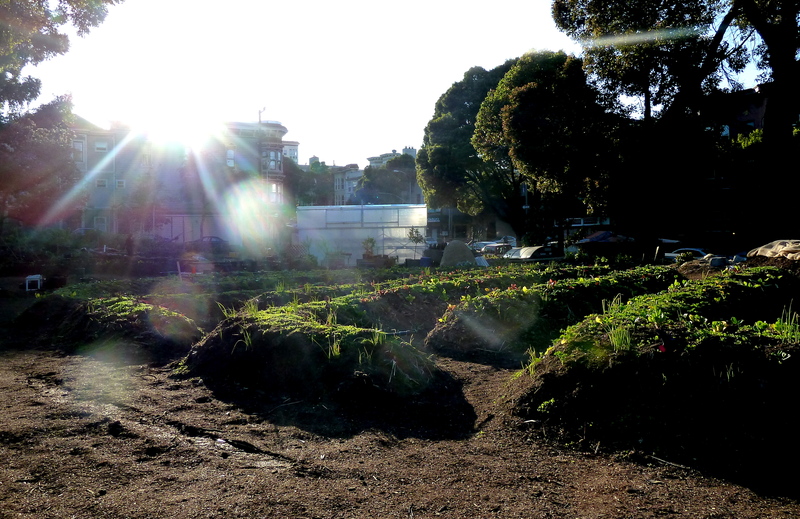 As such, our agreement with the City and County of San Francisco has been to develop the ecology and grow food on the site only until those with prior claim to the land were able to move forward with projects that have been in the works for some time. In January, we received final word of the formal termination of our license agreement from the City and County’s Real Estate Division. On March 1st, as part of this agreement we transitioned off of the south half of the property (Parcel P). By June 1st, we plan to be off of the site completely. 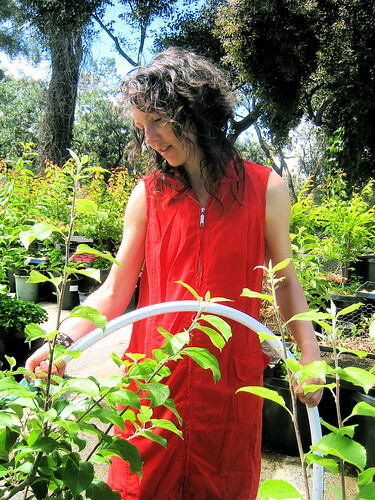 Hayes Valley Farm is a champion of interim-use farming. 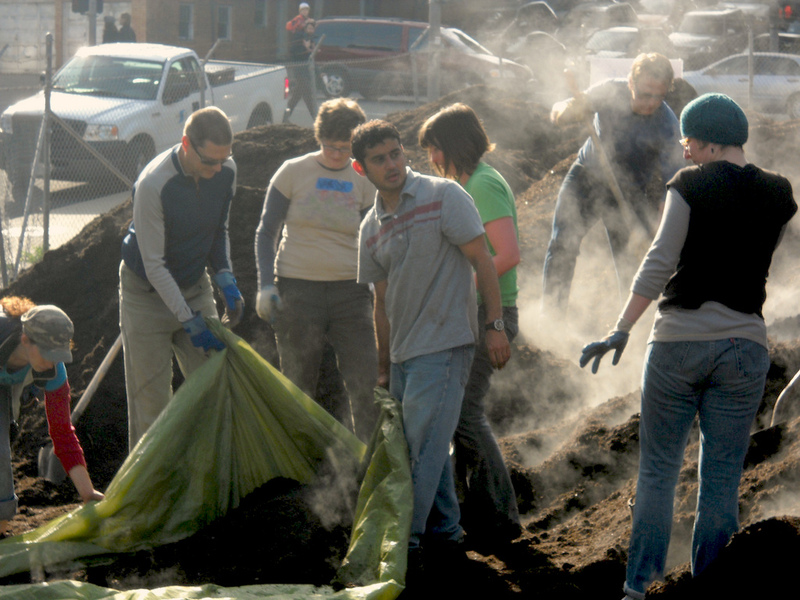 Not only does interim-use provide an opportunity to rethink how we use the land and demonstrate how much food can be grown in a given area, it also allows us to engage in education, outreach, community building, and to develop broader, transportable, resiliency models that we feel are essential in this era of transition and transformation. 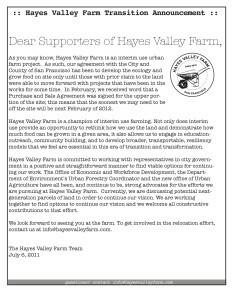 Hayes Valley Farm is committed to working with representatives in city government and our community in a positive and straightforward manner to find viable options for continuing our work. The Mayor’s Office of Economic and Workforce Development, the San Francisco Parks Alliance, and the Hayes Valley Neighborhood Association have all been, and continue to be, strong advocates for the efforts we are pursuing. We continue to explore and discuss potential next generation parcels of land in order to continue our vision. We are working together to find options to continue our vision and we welcome all constructive contributions to that effort. In these last few months, we look forward to seeing you at the farm. 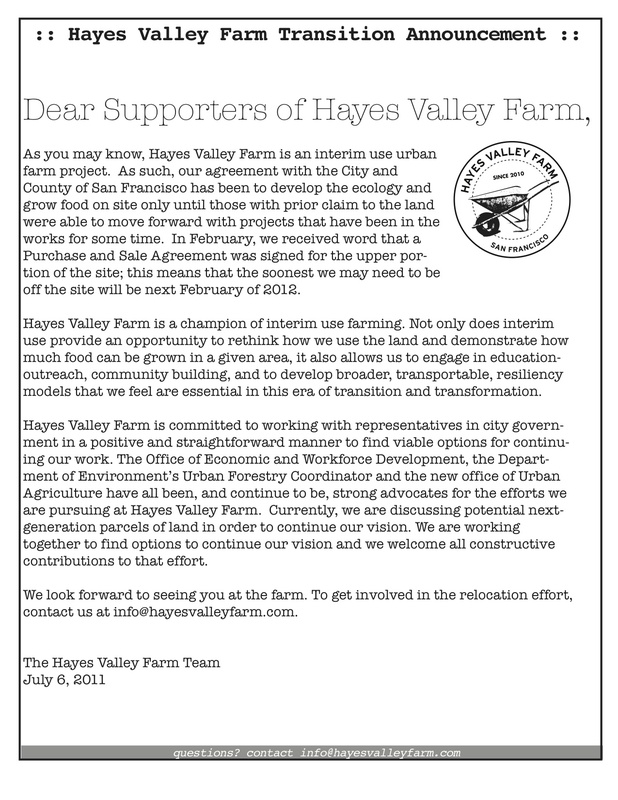 Below: Transition Announcement from July 2011, posted on the gate at 450 Laguna Street. Jay asked me to write the blurb for the breakfast club, at which point I had to ask him what the breakfast club was. He said the breakfast club is a riff on farmers who rise to do the necessary daily chores before they have breakfast, but since we’re in an urban setting, and since we might not do the chores before breakfast, we are sort of like those eighties slackers who found transformation sitting in Saturday detention. What made the breakfast club the breakfast club was the fact that they were in trouble. I was in some trouble when I started watering this spring as well. It was a vague kind of trouble, a knowing that life didn’t have to be so hard. The teenager in me was rebelling against a life that was expected of me, but which I did not want to live. When it turned out that Emilio—I mean, Rob Joyce—was going away for a while and wouldn’t be able to water, I found myself in detention, I mean on the farm. I hope that some day all detentions can be focused on the careful offering of water to young things. I attribute it to the calm of being surrounded by leaves rustling in the breeze, the feeling of cool water, and the smell of mulch that comes with spending several hours on the farm every day. The sounds of the city are buffered by the wind and all those non-human living things. Also, one can hear children become elated and exclaim about “the farm” as they are wheeled by. Suddenly I am very conscious of not getting water on the man who sleeps on the sidewalk below the favas, whose home orbits Hayes Valley Farm. For the past couple of months, Ally I mean Jenn, Rob and I have been doing the watering. There is a lot to care for and water these days. There are the seedlings of brassica, mustard, lettuce, tomato, marigold, beans, tree kale, there are the grafted fruit and nut trees of the freeway food forest, the berms on the on and off ramps that boast nitrogen fixing fava beans and new zealand red clover, the shade garden…. There are other members of the breakfast club too: Judd keeps planting more seeds and raising the seedlings with the “Show Me Your Starts” crew, and there’s a bunch of others who have helped turn the compost, plant seedlings, scatter rock dust, and clean up the site. Karl Marx, in his critique of capitalism said that people want to work, but capitalism robs that natural desire in people because work is abstracted from the true meaning that emerges from an orientation of sustainable bioregional production. I’d like to think that this breakfast club consists of anyone who has ever avoided certain work and in the process found crazy beautiful meaning in the simplest of tasks. Gets one to wonder who is caring for who. Is it breakfast clubbers that care for the seemingly fragile green things, or them for us. On Farm Film Night this Tuesday, we will celebrate our coevolution with plants by screening The Botany of Desire. Based on the book by Michael Pollan, the film explores the power dynamic between plants and people, as well as what plants reveal about human desire. If tulips have tamed us with their beauty, I would argue that the fava bean illustrates our desire to attain prosperity. Berms of fava, buzzing bees, volunteers leaving with bags full of beans: Hayes Valley Farm has been prey to fava fever during the last few months. The fava bean has been stamped into my mind and settled into my stomach. But what do all these favas mean? How does our relationship to them on the farm relate to their longer history with us? My personal history with favas began in Florence, Italy. A lovely spring evening was unfolding when I split open my first bean. “Questa e una fava,” I was told over dinner. I looked at it in awe and puzzlement. 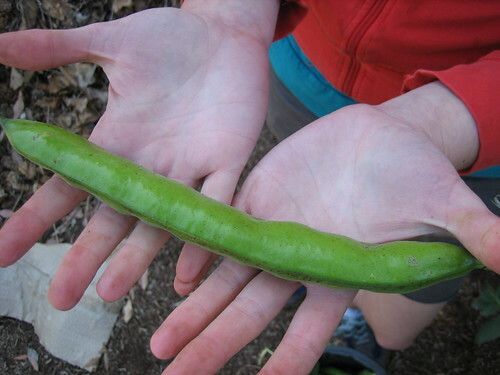 Was it an oversized pea pod, a green bean? “Non capito,” I said. “I don’t understand.” My Italian family and I consulted a dictionary, but I still couldn’t decipher a translation for the long green mass. Broad bean. My hosts enlightened me to the practical meaning of a fava in central Italy: you eat it. For the three short weeks it was in season, I eagerly consumed the favas paired with pecorino romano cheese. It wasn’t unusual that I didn’t meet the fava bean until I left the country. The fava bean isn’t well known or well grown in the United States. The fava’s history extends back far before it’s appearance on the plate as an appertivo. In fact, fava beans are one of the first plants cultivated in the ancient world and can be traced back in our diet more than 8,000 years. They are believed to be the first beans Europeans ate. Greek philosophers waged heated words in favor of and against the fava. “Avoid fava beans,” Pythagoras warned. The genetic disease favism can cause illness and even death. Yet, we chose to propagate the fava for the very chemical characteristic that could kill us. “You didn’t eat your fava beans, did you?” I chastised. The G6PD deficiency favas cause in our blood can protect us from malaria. Humans stood to gain a great deal when they took a risk and ate favas. Our gene pool selected for people who could benefit from favas and overcome malaria. Favas helped our numbers prosper. It might come as little surprise that Jack’s magical beans were most likely fava beans. Favas literally stand alone when it comes to beans growing straight up to the sky. Their stalks do not need support like other bean vines. And, as the narrative goes, fava beans can mysteriously turn strange looking beans into wealth. Jack got a hen that laid golden eggs out of the bargain, but more practically, fava beans help create rich soil. A key reason fava beans are rare in the United States is because they are no longer used as a cover crop. 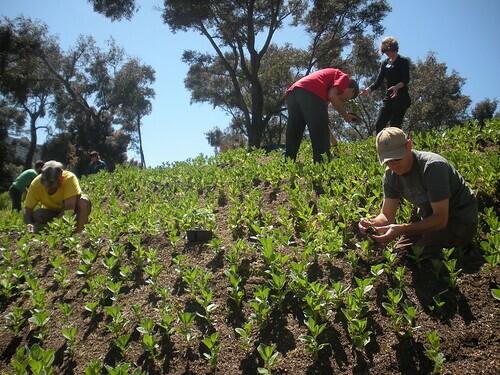 Hayes Valley Farm selected to plant a plethora of fava beans for it’s an amazing ability to fix nitrogen into the soil. But most farms in the United States now use chemical fertilizers in place of a legume cover crop. Cover crops like favas also protect the soil like a blanket during the winter, holding in moisture and preventing erosion. 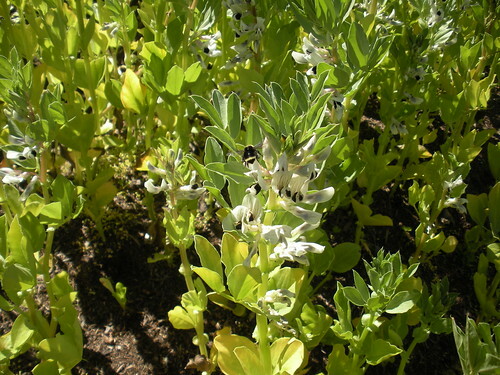 Favas can grow in salty poor soil where other crops cannot. They rejuvenate the soil with nutrients and life. When it comes to soil, fava beans are truly magical. Fava beans have played a significant role in our survival and success over the course of millennia. And, as Jack’s story epitomizes, they speak volumes of our desire for prosperity. But, they aren’t the only plant we have evolved with. Come join us Tuesday to discover more about our relationship to the apple, the tulip, marijuana and the potato.